When people think of the Pacific Northwest (PNW), they often think of water. Whether that water comes from rain creating lush trees and flowing streams, the famed Columbia River, or the Puget Sound, home of the world’s best-known orca family, the northwest is a wonderful place to seek water and all the activities that go with it. Finding a place to go boating in the Pacific Northwest is only difficult if you cannot decide what kind of water you want to explore. Open ocean and coastal bays, inland seas, rivers both lazy and full of whitewater, and large inland lakes are all possibilities in Washington, Oregon, and British Columbia. Boating here is year-round, due to the temperate maritime climate, though the winter months can be rainy, foggy, and windy. East of the Cascades, ice and snow limit the sport to half of the year. Here is a look at some of the top boating regions, and the kind of activities that they have to offer boaters. Ocean lovers, sailors, and circumnavigators all love the many things that boating along the coast has to offer here. The waves can be strong here, but there are several bays, ports, and harbors to keep safe during inclement weather, including Gray’s Harbor, Willapa Bay, and Coos Bay, among others. Highlights on the Pacific coast include whale watching and fishing. Gray whales are very common out here, as are minke whales. Humpbacks are occasional, and if you go far enough out, you may even be lucky enough to see a blue. Deep sea fishing here can be rewarding as well — salmon, halibut, and rockfish/snapper are among the prized fish that people watch for. If staying on the coast, the razor clam fishery is a fun and popular diversion in between boating trips. Oysters and kite festivals are common draws along many of the coastal towns as well. The coast requires a boat that can handle high winds and swells, and that is equipped with the proper offshore safety gear as prescribed by the coast guard. The Salish Sea is the name for the large inland sea that begins at the north end of the Olympic Peninsula of Washington and heads inward toward the cities of Olympia and Seattle. It is comprised of several sections, each of which has its own popular boating activities. Strait of Juan de Fuca: The Strait represents the Northern border of the continental United States, as it sits between Washington and Vancouver Island in Canada. To the north, the city of Victoria is a small, cosmopolitan city with wonderful European influences and top-notch cultural amenities, like high tea at the Empress Hotel (proper attire required). To the south, several tribal reservations and the towns of Port Angeles and Port Townsend (wooden boat capital of the US) offer moorage and a good meal. The Strait is almost as rough as the coast when it comes to waves, but it is also a mecca for halibut fishermen, surfers and windsurfers. As it gets close to Puget Sound and the San Juan Islands, there is more protection, and moorage and shelter opportunities increase. San Juan Islands: These islands have two particular claims to fame. First, they are considered the sunniest locale in western Washington, due to the rain shadow created between three different mountain ranges to the west, east and south. Second, they are home to the famed resident orca population of Washington state, which is one of the most friendly and reliable whale watching population in the world. Boating is common, and there are marinas that take visitors to many of the islands. Getting there requires a boat that can handle the occasional large wave, as swells up to six feet are common, and tidal currents can be swift, so plan your path accordingly. Divers will also enjoy the San Juans, as the turquoise water and bright-colored, large wildlife is beautiful and diverse. Whale watching rules should always be followed if you are looking to follow the tour boats. Hood Canal: This region is known for warm, shallow water that is great for swimming and waterskiing, calm waters due to the rain shadow of the Olympic mountains, and some of the world’s most famous oysters. Boaters in the canal range from small rowboats and kayaks to sailboats, windsurfers, yachts, and even the occasional US Navy submarine headed back to its base here. Anchoring out is a bad idea here, as the tidal exchange is very extreme, and unfamiliar boaters often wind up beached. However, there are several great marinas and even hotels with dock space along the way. The floating Hood Canal Bridge has a drawbridge to allow taller traffic through, which can be hailed via VHF. Puget Sound: This inland region is home to the cities of Bellingham, Seattle, Tacoma, and Olympia, and is home to one of the nation’s largest international shipping ports. The Sound is very diverse, however, and is also the gateway to a number of small, quiet bays and beautiful beaches. Tides and currents can be very extreme here, with a range of 16 or more feet in a single day, so boaters unfamiliar to the area should look for marinas and designated mooring buoys to avoid unintentional grounding. In addition to the whales and porpoises to be seen here, boaters regularly see harbor seals, sea lions, and bald eagles. 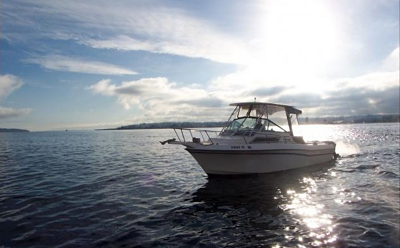 There is no end to the activities that boaters can enjoy in Puget Sound — fishing, diving, swimming in the shallower bays, sailing and powerboating are all easy and fun here. The sound is well protected, so wind waves are rarely an issue outside of tidal convergence zones, and the wildlife and scenery is beautiful and diverse. The Columbia River marks the boundary between Oregon and Washington. It is the historical site of the first European visit to the west coast, and a major international port. Boating the Columbia is a fun and exciting endeavor. The first leg of the journey brings with it a very strong wind, making it ideal for sailors and windsurfers. As the winds calm near Portland, the adjacent region is a wonderful way to explore this island city by boat. Fishing and swimming can be fun here, as the water is calm and warm. As you head inland, sheer bluffs with fossilized trees and sagebrush plateaus replace the towering evergreens, and large dam and lock systems raise boaters into higher elevations. The Columbia connects with the Snake River, which can be a fun side-trip for whitewater enthusiasts. The Hell’s Canyon section of this river is deeper than even the Grand Canyon, and well worth a visit. This region of the Pacific Northwest is often forgotten beside the lush rainforests, inland seas, and snow-capped mountains. However, the dry sagebrush plains of eastern Washington and Oregon comprise a much larger percentage of both states by area. Within these regions there are some large rivers and a number of lakes, though many of the boating lakes are in fact reservoirs. Weather in this region is dry and extreme. 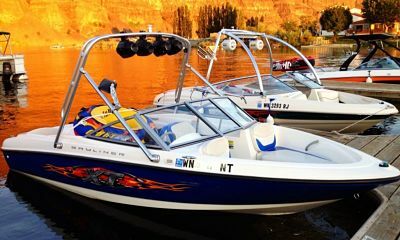 This can mean that boating is most possible during spring and fall, as drought and ice, respectively, can stop boaters during mid-summer and wintertime. Swimming, fishing (often stocked), waterskiing, and small boats are plentiful and fun in this region. Several resort towns or famed parks sit on the edge of many of these eastern lakes, including Lake Chelan, Detroit Lakes, and Crater Lake. For those heading north to Alaska, this is the sheltered, preferred passage for all but the largest vessels. The Inside Passage starts to the north of the San Juan Islands, and sits to the east of Vancouver Island, off the coast of British Columbia. This area includes the Gulf Islands, and continues into southeast Alaska. A trip through the Inside Passage can be epic and beautiful, but it requires an experienced boater and good planning. A boat must be enclosed enough to protect its passengers from storms, shallow enough to make it through the tighter channels, efficient enough to stretch between fuel stops, and powerful enough to fight currents when needed. Weather makes the summer the appropriate time to make this trip. Additionally, strong tidal currents can stall an engine completely if the wrong side of a channel or island is chosen during a flood tide. Fuel stops are rare and remote, and a good knowledge of a boat’s capabilities is highly recommended. Finally, many marine hazards are not well marked or known here, and boaters must be very cautious. For the experienced, the trip is well worth the effort. 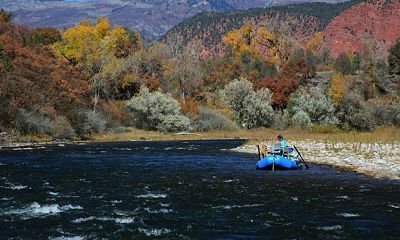 Extreme views and remote wildlife abound, and there is often the ability to feel like the only boat on the water. This passage is, for many, the best boating trip of their lives. Whether you are a new boater or a lifelong captain, there are many wonderful ways to experience the Pacific Northwest by boat. A trip here makes it easy to see why boating is one of the most enjoyed sports in the region. The best part of boating here is the diversity of the region. Whether you love fresh water, inland seas or open ocean, small boats, yachts, or sailing, there is an unforgettable boating adventure waiting to be had in the Pacific Northwest.